So the first step COULD have been to apply the material to the doors, but I'm still researching what kind and brand of speakers to install. One problem unique to R33s apparently is that the door mounted 6.5 inch speakers only allow for an installation depth of 57mm... which is NOT alot of space at all (the R32 uses a weird 4X6 speaker up front, the R34 uses the same 6.5 but without the mounting depth issue, apparently). 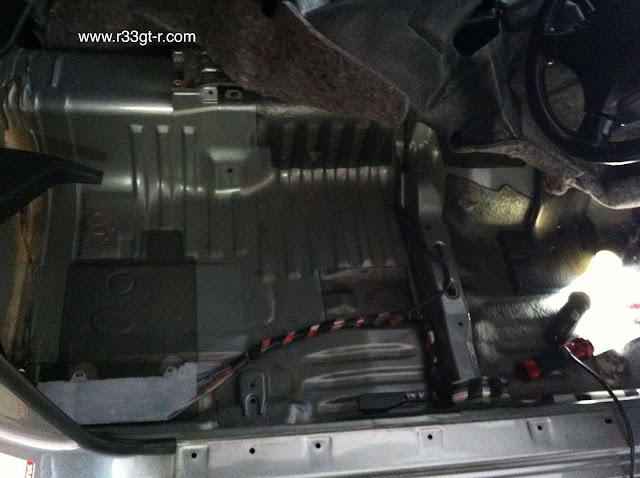 Hence I decided to lay out the RAAMmat and Ensolite on the floor of the car. The RAAMmat works by dampening vibration, while the Ensolite blocks out sounds (although some people will claim that the Ensolite layer is actually just a substrate on top of which you can apply a real sound blocker... whatever... maybe but again my goal was maximum results with least weight gain). So, I first started by attempting to remove the carpet. 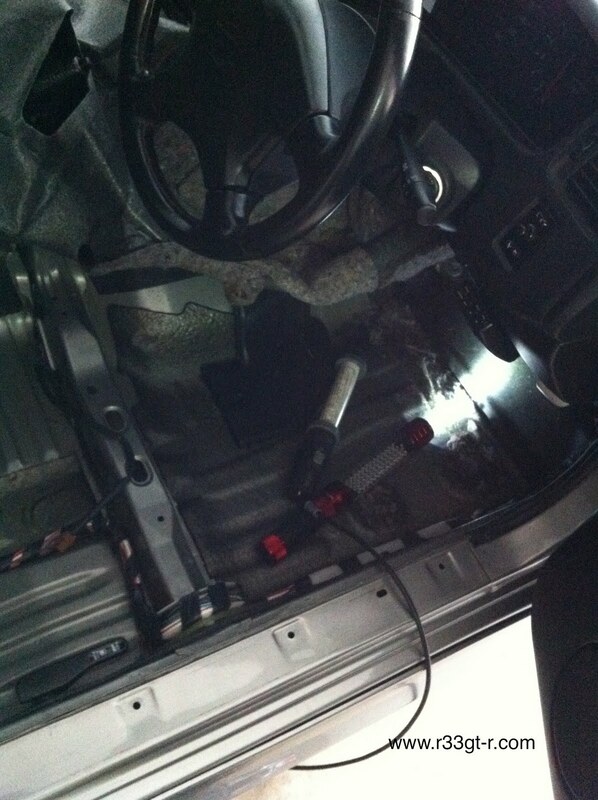 The plastic "SKYLINE" Side scuff plates come off easily, and a few turns of the screwdriver released the dead pedal and the gas pedal stop on the driver's side. A few more turns and the center console and shift lever surround came off... and this is when I realized that if I wanted to remove the entire carpet, I was going to have to remove most of the dashboard too... OK so this is when I decided that I would simply fold the carpet over onto one side, lay the materials on the exposed floor, and the repeat for the other side. That wasn't so bad...but then I realized how DIRTY it was underneath the carpet. You are supposed to apply this material to CLEAN surfaces only. So after vacuuming bits of dust and dirt, I broke out the Simple Green and brake cleaner, and used a rag to wipe down as best I could. 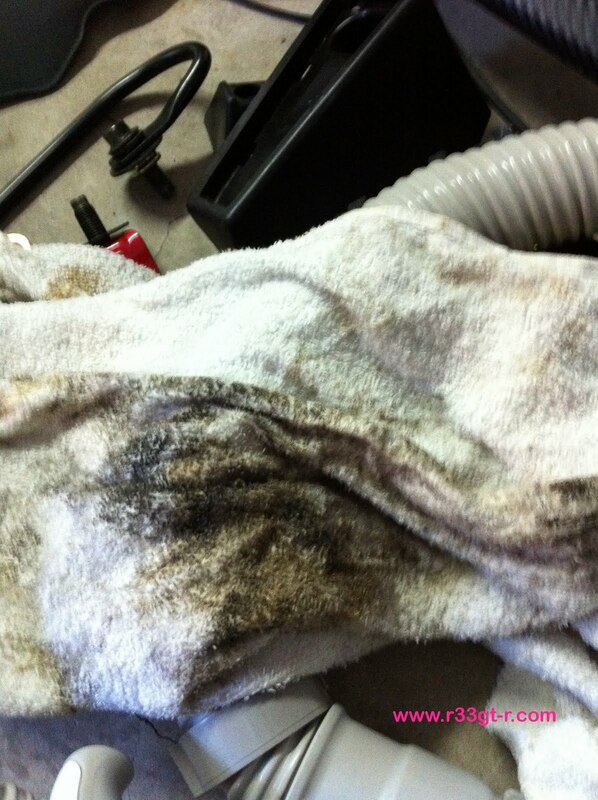 Check out how FILTHY the floor was!!! Where did this grime come from? Anyway, once clean it was pretty simple. The RAAMmat has adhesive qualities on the butyl side (the non-aluminum side) so it's just a matter of cutting the pieces to fit the area they are covering, peeling away the sticker, and then applying. Rick had advised me to use the "knock" test to find out which panels had the most vibration. You apply the panels to such vibrating areas and the panels would in theory reduce such vibrations. Unfortunately, I detected 3 different knocks - a very solid one on the front edge of where the rear seat goes, the floor itself had SOME "tinny" sound and the sidesills sounded almost hollow (actually I think they are)! So, although Rick had advised just applying the RAAMmat to places that sounded tinny - I ended up laying the mat over the entire floor - all except for half of the area in front of the passenger seat, which, perhaps due to the factory sound proofing, was extremely solid feeling and sounding. Once the mat was laid out, then I applied the Ensolite - again a simple peel away revealed a sticky surface which meant just cutting and applying as needed. However the Ensolite needs to cover as much as possible, so unlike the mat, I tried to cover as much as possible, even squeezing material up along the transmission shaft. 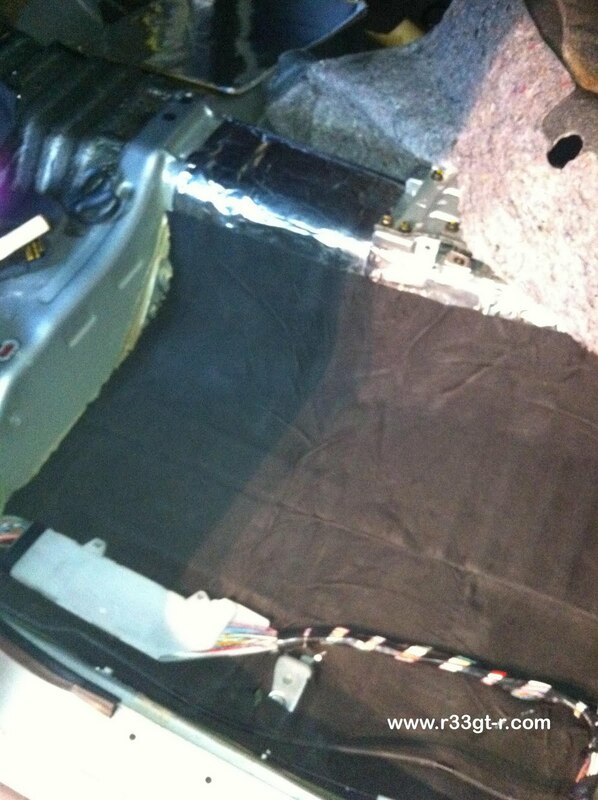 After the Ensolite was laid across essentially the entire floor of the car, I replaced the carpet, and put the front seats back in so I could drive my car on Wednesday night to have the brake upgrade installed (coming up soon on this blog!). 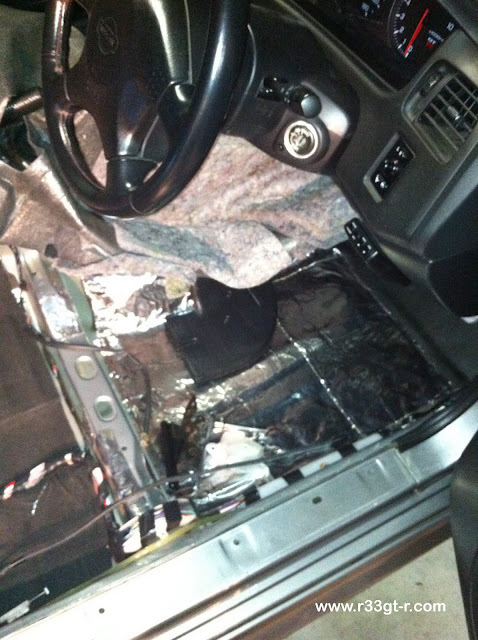 Hence, the rest of the sound deadening will have to wait until I get the car back. So far though I've only used maybe half of the 20 lbs of the material I bought,sot much of a weight penalty I think? What has been the easiest sound deadener to install? I've bought some cheap ones before and they were a real pain to get into the tight spots. Do you have any suggestions for products that will fit easily or are easier to install? Hi Roy, thanks for posting. To answer your question, honestly I do not have any experience other than the RAAMMat, and then a local Japanese brand (Audio Technica) - I assume you are asking about the deadening material, not the sound blocking Ensolite stuff? I think basically the leading companies, you can't go wrong. Although I understand that thinner is easier to install, obviously. The ultimate being some kind of spray on, which I may try for my trunk area. There is a theory that, if there is enough mass, then you do not have to cover the whole panel, as the mass should be able to absorb vibrations. That's what the AudioTechnica stuff was like - very heavy, butyl based, but basically came in 15 cm circles that you stick to the inside of the door sheet metal. And even Rick from RAAMmat also told me the same - that full coverage wasn't needed, even using his thinner stuff. Stay tuned as I will be damping the trunk with a spray on - not done yet with this project!